Sponsored Post: I am a member of the Everywhere Society, and Everywhere has provided me with compensation for this post. However, all thoughts and opinions expressed are my own. Affiliate Links: If you click on a link in this post, I may make a very small commission. This is the first year in my lifetime that I’m not going to be home for the most patriotic holiday there is (at least to me)… the 4th of July. We’re going to be in Paris this year for the 4th. While I couldn’t be more excited to be traveling in Europe, it does make me a bit sad to miss a holiday I always celebrate with my family. I began to realize this week that we’re going to have to make the most of Memorial Day this year in terms of getting our patriotism on. Even though that’s not until the end of the month, this holiday is one that always sneaks up on me. Then, being the fashion junkie that I am, I started thinking about what I might wear. I finally found a pair of white jeans that I liked from Levi’s this weekend. I figured a little white on white outfit with some red, and blue accessories would be a fun nod to the flag without being overkill. I’m not one to emblazon stars and stripes all over the place (though I’d never judge anyone that does!) ;) And by the way, if you’re looking for tapered boyfriend jeans, these new Levi’s 501 CTs would be right up your alley. They’re the jeans your mom probably wore in the 80s/90s but have been updated with a modern silhouette. Be warned, they do run large so I’d recommend going down a size or 2. I’m going to be trying to shrink mine up a bit in some hot water. If you’re ready to celebrate some red, white, and blue too, Macy’s is hosting a party, and you’re invited to join for all the in-store excitement and family fun! Macy’s is proud to partner with those who have served our country alongside Got Your 6 to celebrate the American heroes, our active servicemen and women, and our veterans. For my fellow Seattlites, the Macy’s American Icons party is happening this weekend on May 16 at 2pm at Macy’s inside the Alderwood Mall. I’m going to be live tweeting from the fashion show that will be hosted by fellow (and much more famous) fashion blogger, Courtney Kerr. You may recognize her name from her show on E! a few years back, Courtney Loves Dallas. If you’re also a Pacific Northwesterner but a little south of me, try Portland’s Washington Square tomorrow. And for my friends in California, there’s a party for you in San Francisco or Costa Mesa also on Saturday! 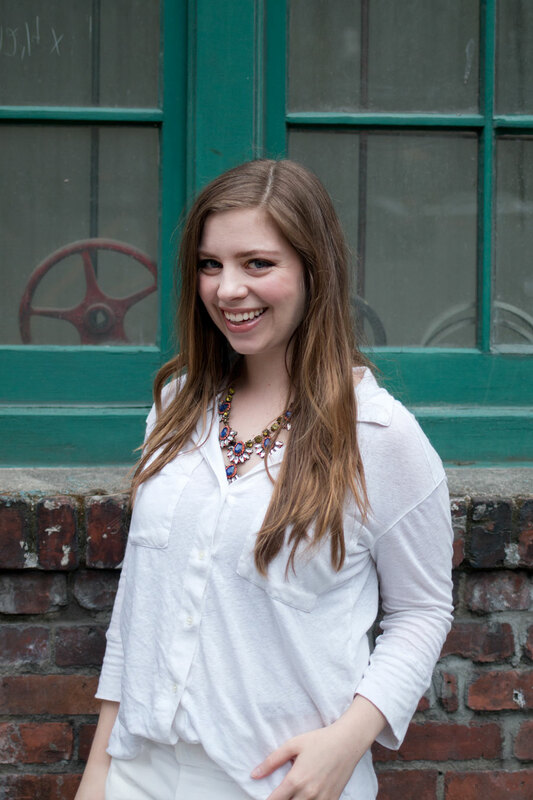 They’ll be snacks and sips, a live DJ, a DIY station, and the opportunity to meet Courtney. Make sure to take an #AmericanSelfie in one of Macy’s patriotic photo opps in store too! If you’re a fellow Pacific Northwesterner, I hope to see you this Saturday, and if you’re not local, see if there’s an event happening near you below! Every event is different too! Check out macys.com/americanicons to find out more details. Do you dress differently for any of the patriotic holidays? I’d love to hear how you style the red, white, and blue! 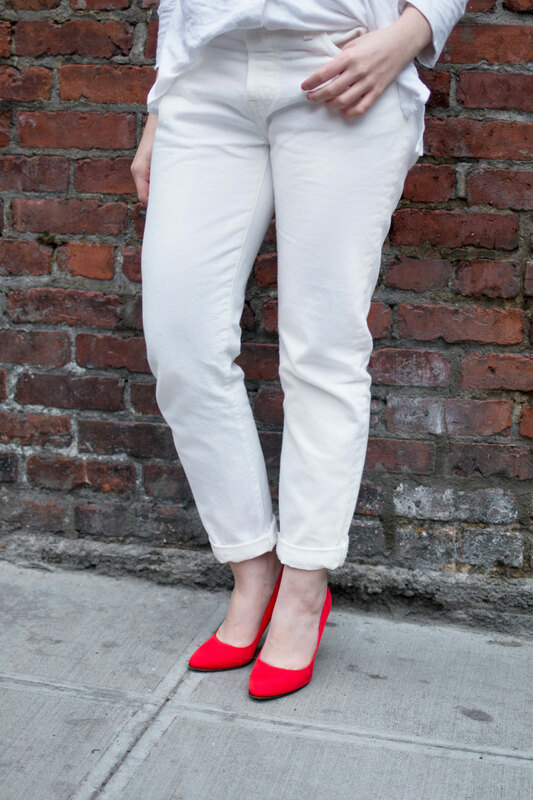 Wearing an all white look is sometimes quite a task, but pairing it with that statement necklace (which I love btw) and red shoes is an A+ for me. I’m Italian and when it comes to patriotic outifits I’m a bit in difficulty but I have a cute purse with the Italian flag’s colours on it that it’s awesome, and I style it with a total denim look. Sounds like a cute outfit! Thanks Ellie! I try to dress up for the holidays but half of the time I completely forget! lol! I have patriotic outfits for my daughter for memorial day and the 4th but haven’t really thought about anything for myself yet. lol I should probably get on that! I love the white on white look! I tried it last summer but it never made the blog because I didn’t like it haha. I may have to give it another go this year! Thanks Maddy! Yes, definitely do! I know you could rock it! If I was wearing that I’d have to eat only red and blue foods so my outfit would stay patriotic. If I manage to not spill something on myself, my three-year-old definitely will. I’m in the market for white jeans, now I want to try a white on white outfit. You rocked it girl, thanks for sharing!! Thanks Avery! I think you should go for it too! i laughed so hard at Breenah’s comment. that’s me too. the white looks fabulous on you, but it’s definitely not something i could wear. it’s super cute though and i love the shoes! Haha! It cracked me up too. Thanks Kristen! I usually buy a 4th of July shirt for me and my daughter to wear, although I think I might make them this year. Haha! Rigby is actually pretty clean and it helps that we don’t have a backyard (condo life, haha) for him to dig in! Making 4th of July shirts for you and your daughter sounds so fun! I would love to spend the 4th of July in Paris. Although it’s just another day to them, I think it’d still be fun to be overseas. I love Paris! This outfit is so perfect! I love the pop of red. Definitely perfect for Memorial Day. I love any excuse to dress up with a theme! 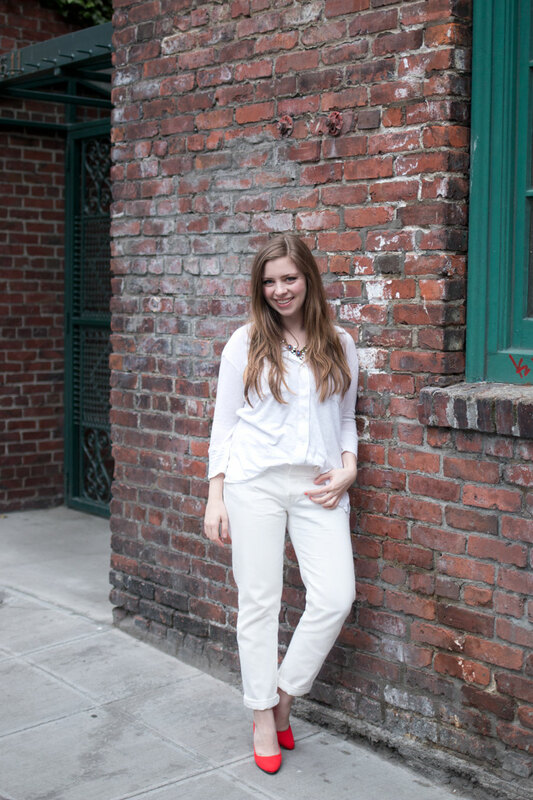 White on white is so on trend this season and those shoes are a fun Pop of color! Haha! Good point, and thanks Elana! I love any occasion that involves festive colors – especially red, white, and blue! I know right? So much fun! Here in RI we have the oldest 4th of July parade in the country, so you can imagine that it’s a pretty big deal around here, so YES I plan out my night before the 4th outfit as well as the day of! That sounds like so much fun, and how cool! Jenn, this is so cute! The 4th of July is a huge holiday in my family and I travel back home to celebrate with them every year. I usually do red shorts with white sandals, white top and a blue bauble necklace. It’s kind of my go-to outfit because it’s theme without being over-the-top (like the rest of my family who basically wears the flag). Aw, thanks Ashley! Your outfit sounds adorable! I love the white on white trend. I like to go all out on the patriotic holidays and dress head to toe in red, white, and blue. Love the pop of color in the shoes! I don’t know if I could pull off the white on white thing… but you rock it so well! And yay for Europe! Aw, thanks so much, Suz! You are the bravest chica I know – all white outfit!! I would immediately spill everything on me. You are killing it! The forth of July is a pretty big deal for me too! And one of my favorite parts is coming up with the outfits (yes there are more than one, one for out on the lake, one for the day/watching fireworks, and one for the party)! Ha! Love that you have multiple outfits for the 4th! SO jealous you’ll be in Paris this year! This all white ensemble is too cute, love the pop of color with the shoes! Aw, thanks Morgan! I’m super excited for it. Now I kinda wish I could attend this! The event is coming to Memphis which would be close, but I am traveling to another place in Arkansas early the next morning for more graduation stuff. This outfit is adorable. I love the pop of color that the red shoes provide agains the white outfit! Aw, bummer! Hopefully you’ll be able to catch a different event at Macy’s soon! Thanks Amanda! Super cute! I love white on white, good choice for the celebration. I’ll see you there! Thanks Valerie! Was great to see you! You wear all-white so well, and so confidently! I’m much too clumsy for that much white, haha! I’m so in love with that pop of red! White on white is so classy! You look darling! I absolutely love your white-on-white look :) So crisp and effortlessly chic!